The basis of this information has been gleaned from our mother Amy's diary. It can therefore be very terse at times. The page is under construction, and may stay that way for quite a while! 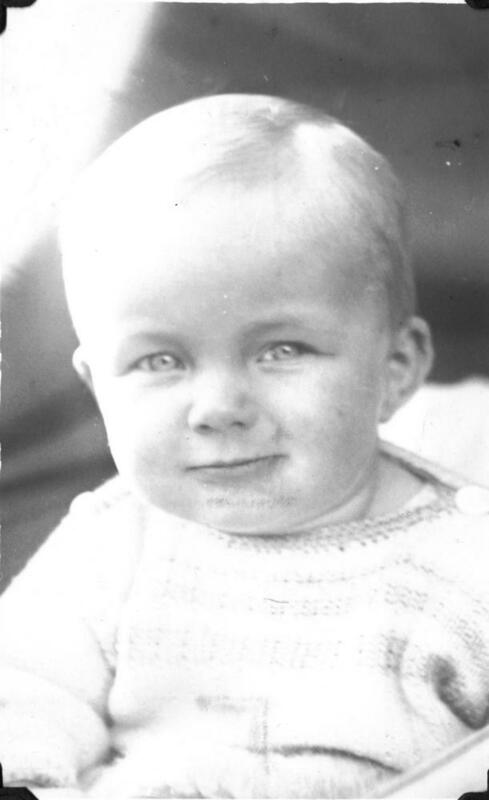 19th April 1932 Arthur born at 20 Third Avenue, Torquay to Amy & Ray. The house was the end house on that side of the road, with a long and very steep garden (at grid reference SX 91207 65655). . . The house was almost opposite Ray’s mother's, and she ran our house too. And, by the way we have heard from Amy “We christened him Arthur, that’s his real name” many times since! 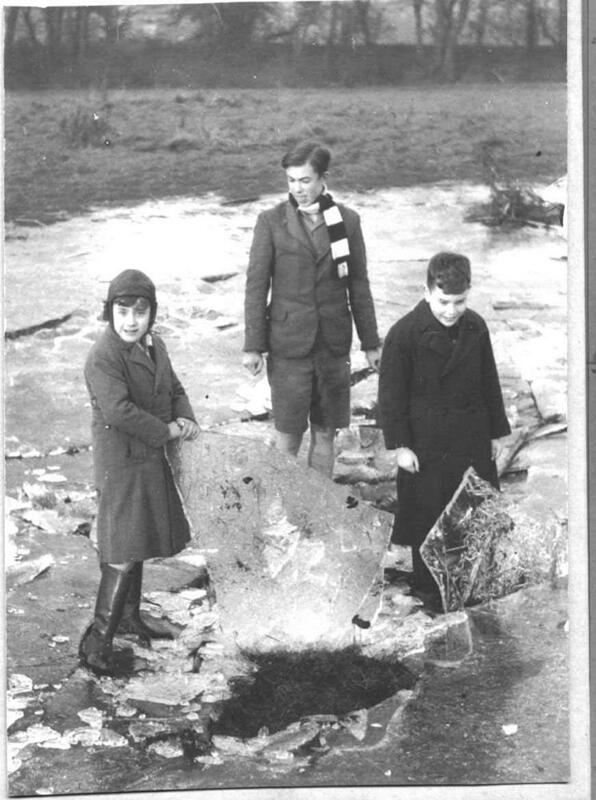 Ray was a grammar school geography teacher (he had a geography degree from Reading University). Amy had been a primary school teacher (she would tell you many times how many children had been in classes she taught, I think it was 50), but in those days women had to give up when they got married. 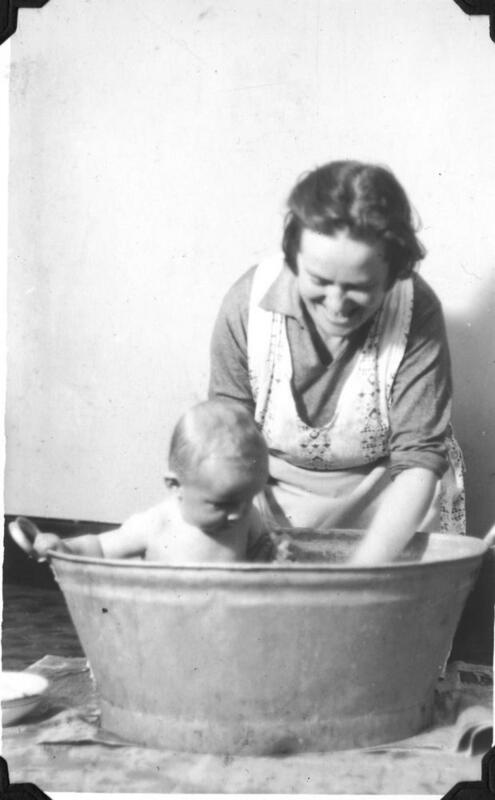 22nd November 1932 Amy in apron bathing Arthur in a tin bath. 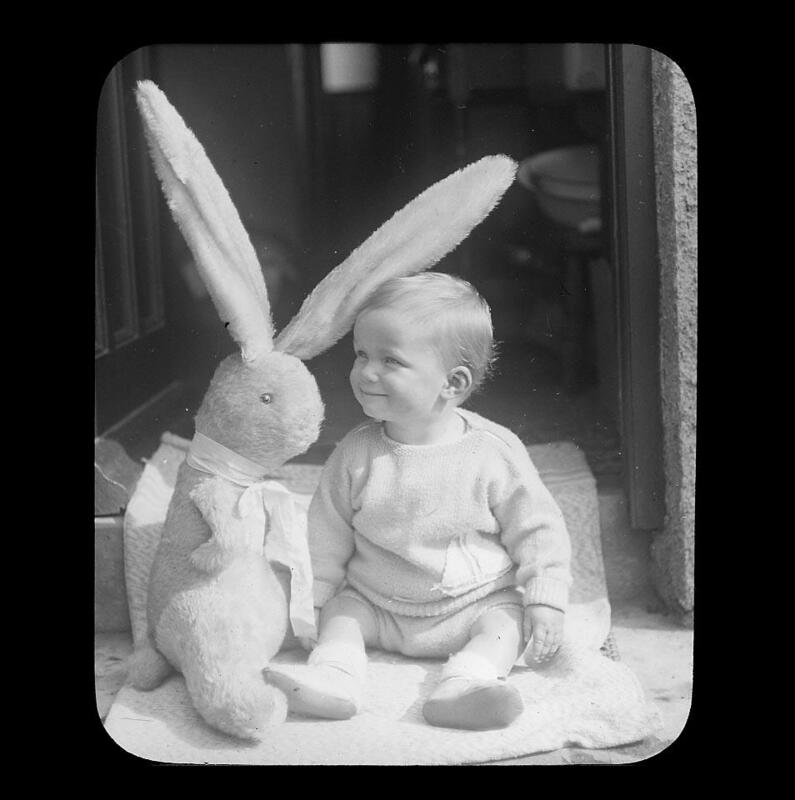 21st March 1934 (date according to Amy's diary, but it must be earlier, we think on 2nd March 1933) - Famous photo of Arthur and his bunny rabbit; one of the rabbit's ears wouldn't stay up, so it had to be propped on Arthur's head for the photo! Was this photo the origin of the name "Bunny"? 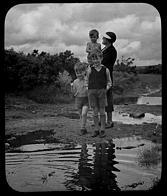 Ray was a keen photographer, doing all the developing and printing himself, and using glass negatives as well as film. 6th July 1935 Brother Owen born at Torquay. Arthur and Owen (and a dog teddy looking like Owen) in the pram. 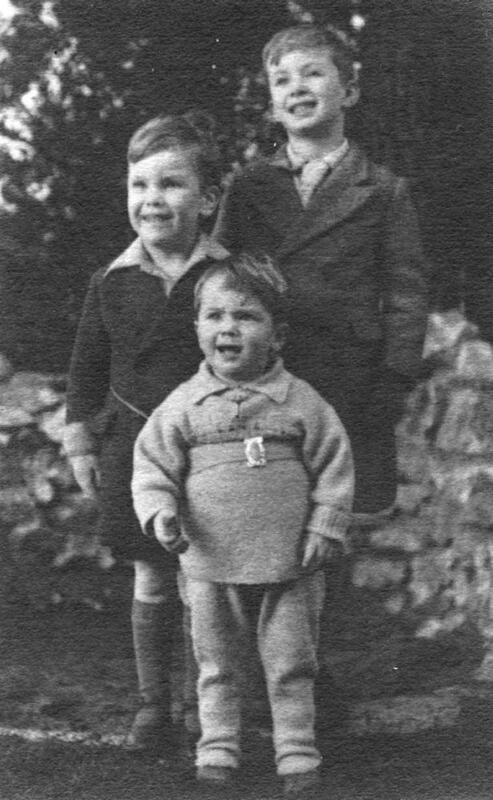 12th March 1937 Next brother Eric born at Torquay. And now there were three! Amy was asked "Is it another boy? "; "Yes. "; "Oh, what a shame!" Mum then lived for many years in a household with four males for company. 18th June 1937 - Arthur started school at Westhill Primary (Torquay). 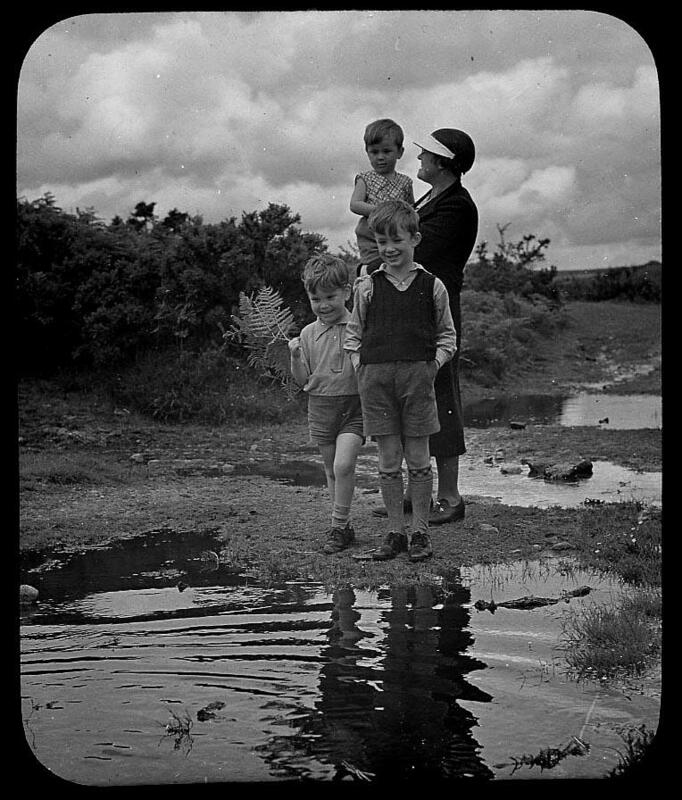 June seems an odd time of the year to start school.. 27th February 1938 - Arthur and Owen had measles – but Eric didn’t! 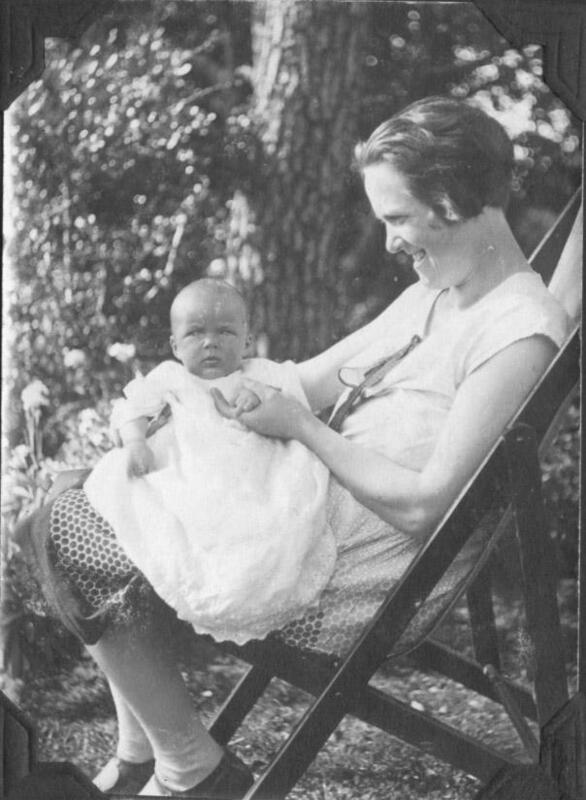 30th April 1938 The first of many hospital visits for Owen, this time Torbay Hospital. Owen and Arthur at Hayle. 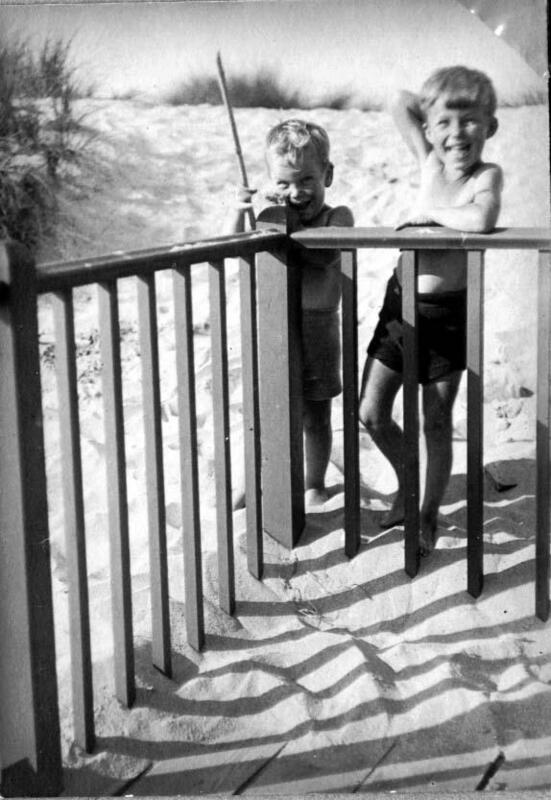 Family summer holidays were in a wooden bungalow “Coney Dune” at the edge of the sand dunes at Hayle Towans, Cornwall. Another family, the Triances, had the adjoining bungalow. It was Mr Triance who convinced Ray to become vegetarian. Amy being a good wife followed him. Eric didn't eat meat until he was at university, no veggie options in 1956! 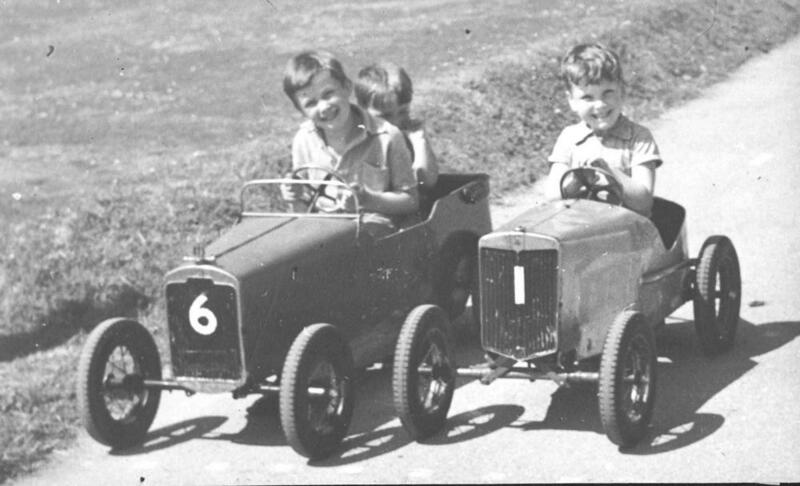 There were day trips to Goodrington Sands nearer home, including pedal car racing. Sunday 4th November 1940 - The family moved into Siam, Yarborough Road, Lincoln (SK 96985 71922), a big 3 storey Victorian house with cellar. It was a snowy winter. 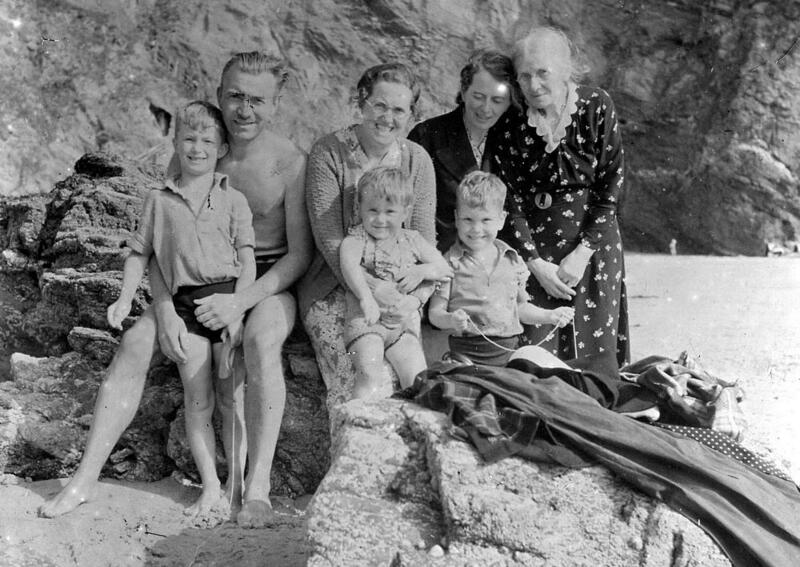 The reason for the move from Torquay was that Dad was a pacifist, a member of the Peace Pledge Union, and pacifism was not popular at that time. The newspapers were vile and abusive (Eric has them all), and Ray was fired by Torquay Council from his job as a grammar school teacher; unthinkable nowadays. The neighbours found out about it from newspaper reports before he was notified. He was left with a wife and three children and no job. Ray started teaching in Lincoln at Sincil Boys [or was it "Bank"?] School ( "secondary modern") in October 1940; he didn't like the school (or was it the pupils? ), and looked nearby for a grammar school post. 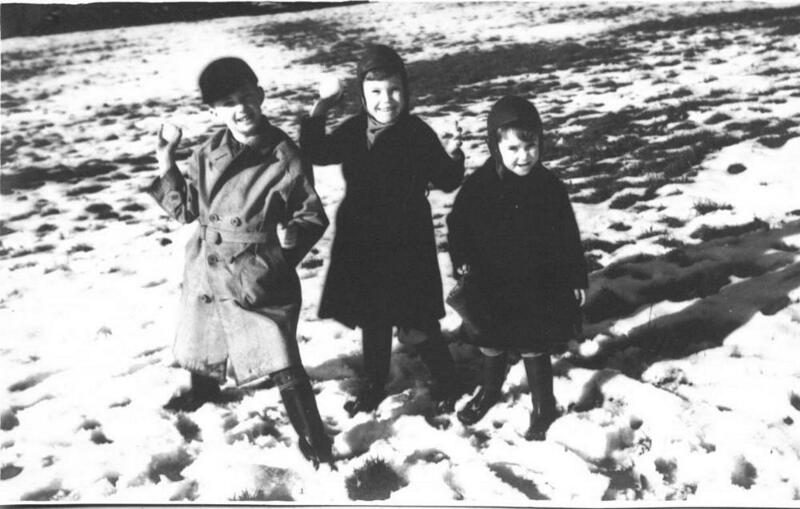 September 1941 - The family moved from Lincoln to Toft, near Bourne Lincolnshire (TF 06723 16957). Amy's diary records that the furniture removal cost was £5 (an open back lorry with a canvas top). We lived about a mile out of Toft in a pair of (very) small cottages isolated in the country, with a well for water. When the well ran dry we walked to a tap in the nearby village, pushing buckets in a pram. Amy’s mother & sister came to live with us when their house in Plymouth was bombed. The cottages were declared “unfit for habitation” after we left, and there is little evidence now that they existed. Ray started teaching at Bourne Grammar School, still as a geography teacher. Arthur and Owen both started at nearby Witham Primary School, about a mile away to walk over the fields, Eric and Mum walked with them. 4th March 1942 - Owen given a bike. 7th March 1942 - Arthur was given a bike. 8th March 1942 - Arthur & Owen learnt to ride. 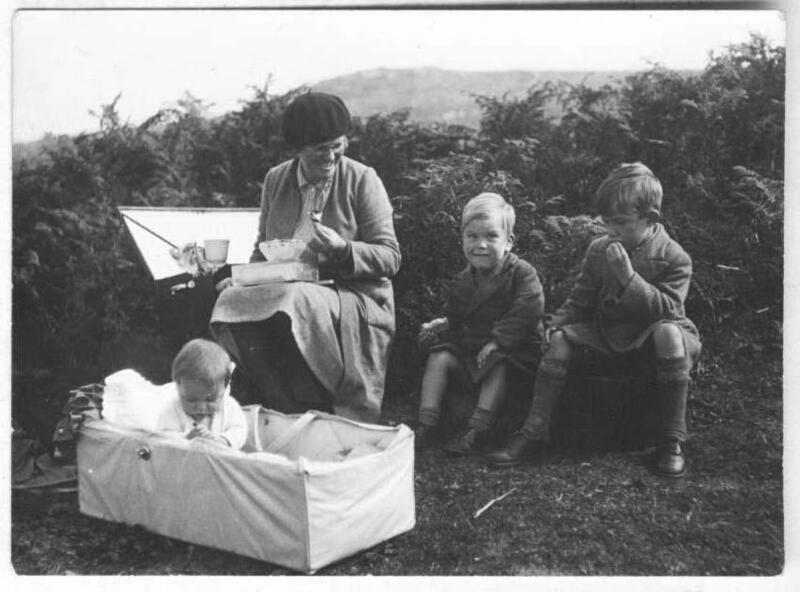 17th November 1942 - The family moved (yet again!) two miles to an old larger house called Journey's End in Northorpe (TF 09683 17537). I remember trips to Essendine Station (where our local line joined the Kings Cross to Edinburgh line, the station closed in 1959) and elsewhere for Arthur’s train spotting. He became a train guru from an early age. We all said “He’ll grow out of it when he grows up …”, little did we know! September 1943 - Arthur started at Bourne Grammar School, three miles each way by bike. Photo taken in a studio at Stamford. 19th April 1945 - Ray & Arthur cycled by tandem from our house at Northorpe to Northampton to visit “Uncle Smith” (Amy & Ray’s best man Bernard’s dad) who ran a small shop. It was a cycle journey of 55 miles. [Best man Bernard Gordon Smith was an artist, but gave it up for ambulance driving in WWII. After the war he became an art lecturer at Epsom College. He played fiddle for the Thames Valley Morris Men.] 15th February 1946 - Ray met Arthur at Kings Cross. 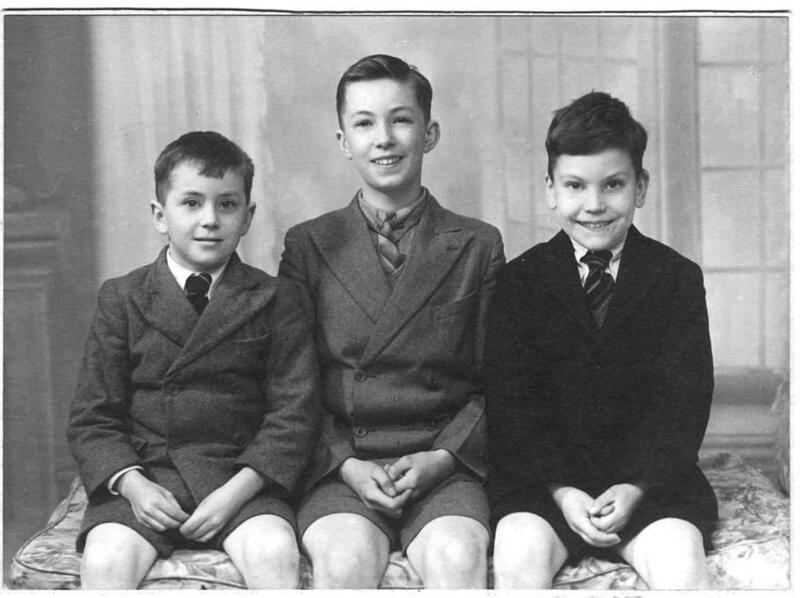 16th February 1946 - Ray took school party & Arthur on London trip. 17th February 1946 - Ray took Arthur to the Science Museum. 12th June 1946 - The family moved (the fourth move I've mentioned so far) from Northorpe to a ground floor flat at 5 Beauchamp Road, Twickenham (TQ 16293 73675). The Beauchamp Road flat was much smaller than our Northorpe house (London house prices!) so much of the family memorabilia was lost. Lost items included the piano (Eric remembers the musical evenings at Northorpe with Dad on piano and Sam Knipe playing his Anglo concertina) and an old "Times Atlas of the World" (Eric remembers a map countoured by the number of days travel from London, the white parts of the world were more than three month's travel) -- but not the magic lantern. The front room at Beauchamp Road overlooked a shunting yard, with Bullied Q1 O-C-O locos in action! 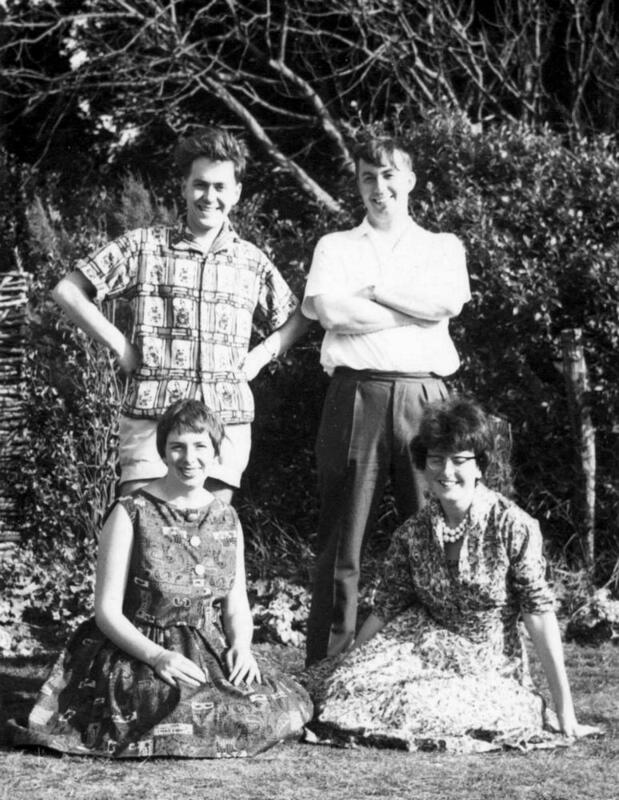 Arthur went to Thames Valley Grammar School (TQ 14969 72457, then co-ed, now a school for girls), Fifth Cross Road, Twickenham, where he later met Janet. She was about two forms younger. 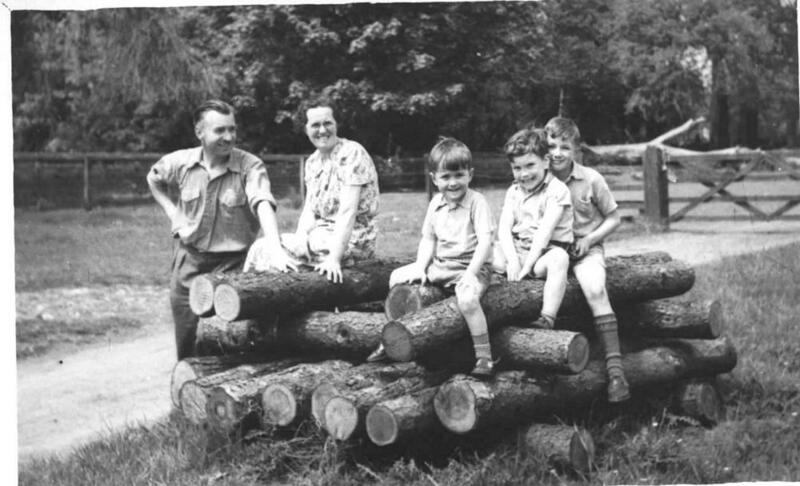 Ray had started teaching in Twickenham at Archdeacon Cambridge Primary School in the April of 1946. He was concerned that we move to the London area for a better environment for the family, more educational museums and art galleries and so forth. He couldn't find a grammar school post, so became Deputy Head of a primary school, Archdean Cambridge School, Twickenham. 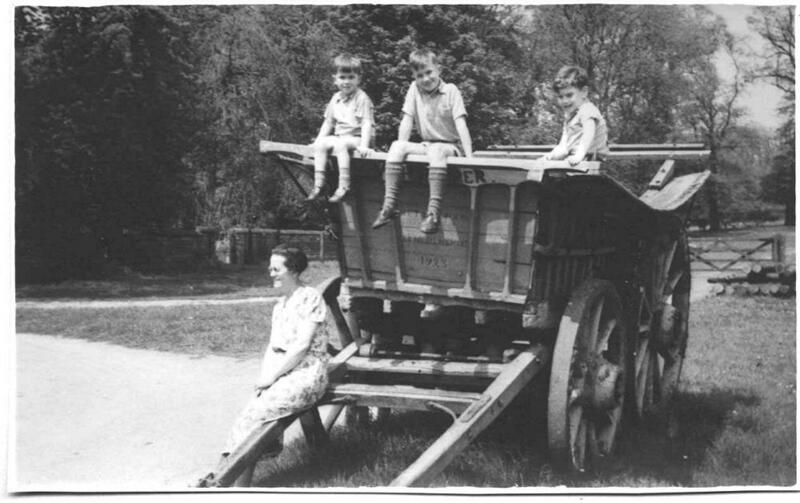 Until he found the Beauchamp Road flat, he lodged with the Scammel family in Egham. 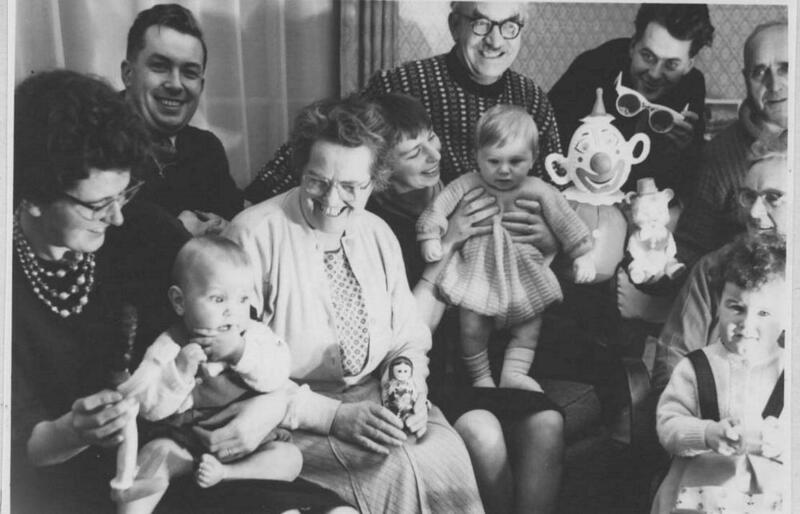 7th Jan 1949 The family moved from the small ground floor flat to a three-bedroomed semi at 13 Albemarle Avenue, Twickenham (TQ 12822 73168). By lucky chance for Arthur, this was closer to Janet’s parent’s house on Hanworth Road! Amy & Ray lived at Albemarle Avenue until after Owen died. 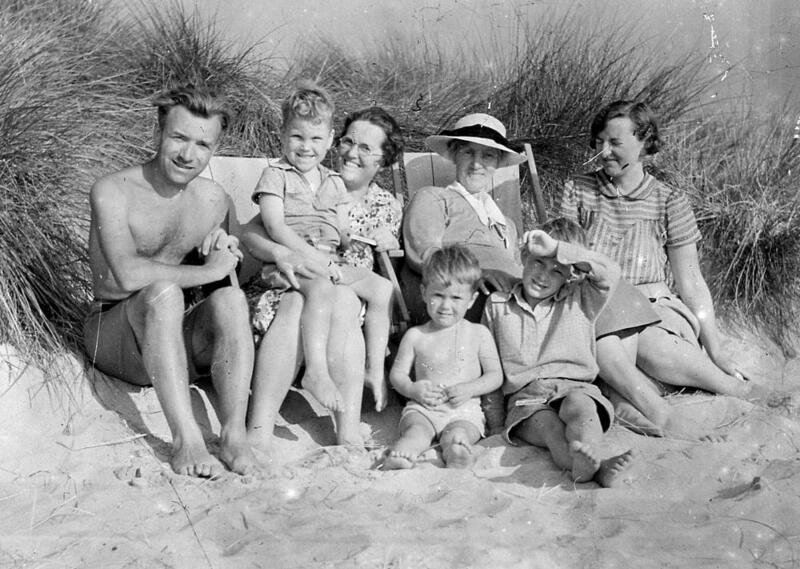 Summer 1949 The family had a summer holiday in a rented bungalow overlooking Pegwell Bay beach just south of Ramsgate. Arthur cycled there from Twickenham (about 100 miles), and had an accident on the way. The police brought him to the bungalow, "just a few scratches". 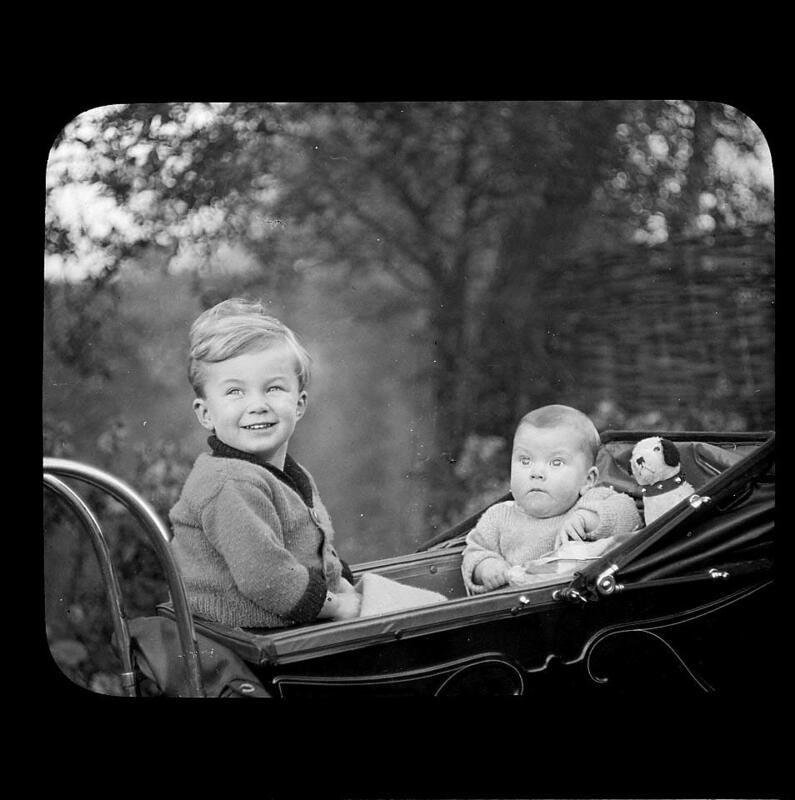 3rd April 1950 - Arthur went to visit a pen-pal Jean in France until 28th April. 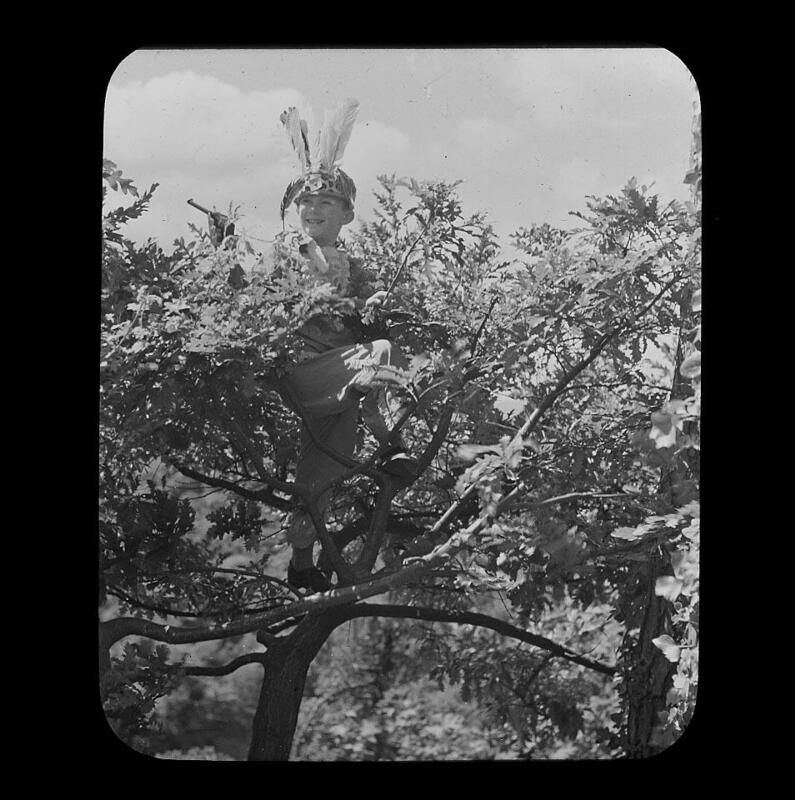 Jean came to Twickenham later for a return visit. 1951– After achieving very good results at school in his "Matriculation" (the predecessor of Advance Levels) Arthur joined the RAF (10th September 1951) in defiance of his pacifist father's wishes. This is the (famous!) RAF publicity photo of a handsome Arthur climbing into his Harvard at RAF Thornhill. 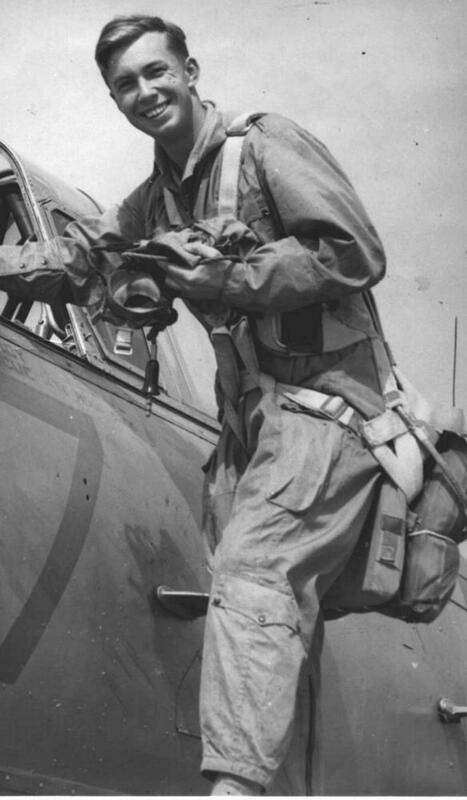 For his National Service he signed up with the RAF for 8 years, received rapid training and promotion (some of it in Africa), and got "thrown out" after two years (bad at formation flying) on 25th September 1953. In this way the required two years of National Service had been completed in much better conditions than if he had signed on for just the two years! 1954 - After leaving the RAF he obtained a job with KLM Airlines from 16th March to 10th October 1954 in their office in a tent next to the A4 at Heathrow. There were no buildings at Heathrow at that time, just a tented camp along by the road. There were perhaps a dozen or two planes per day, you were lucky to see an aircraft movement. Eventually between 7 and 7.30 in the evening there were regularly three aircraft landings to watch. Owen and I could climb into aircraft and look for souvenirs after the passengers had left. It's different now! 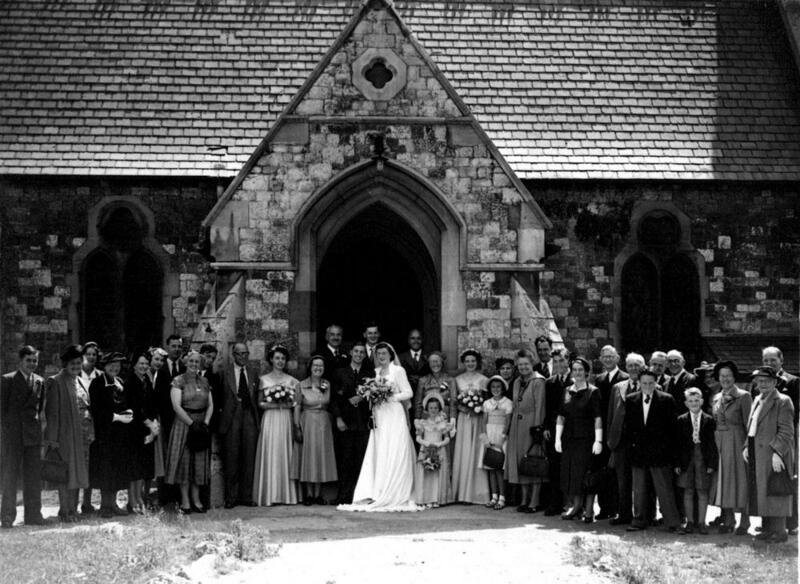 25th July 1953 - Arthur married Janet at Whitton church. I remember that they had a “flat-warming” [? ?Meadow Road, Hanworth??] party for friends and Owen and me. It included a multi-day game of Monopoly. 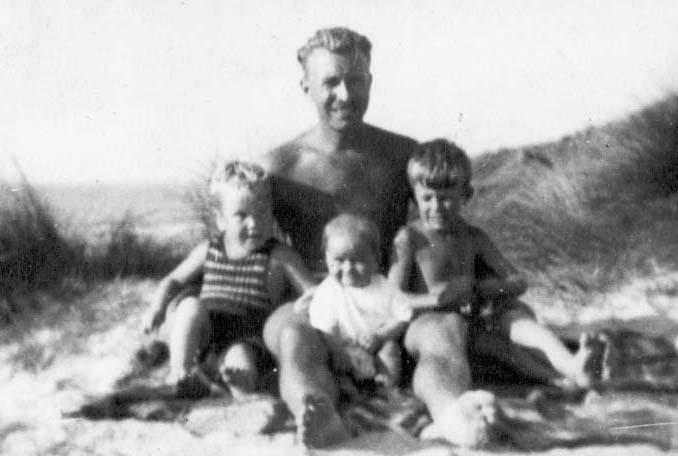 16th February 1957 - Our brother Owen died at Hammersmith hospital. He was aged only 22. Christmas 1955: - Eric had a Christmas job for 2 weeks at "Arthur's shop" (a model shop owned by "ABC models" which he managed from 10th January 1955 until he joined British Rail on 12th March 1956) under London Bridge Station approach. The whole place vibrated every time a train passed overhead. Eric became adept at wrapping odd-shaped objects in brown paper. 4th April 1957 - Eric went on a steam rail trip with Arthur from Kings Cross to Peterborough return, with famous driver Ted Hailstone on his last trip. He was driving (I think) “Silver Link”. We had hoped to break some speed records, but failed. Failure was blamed on bad stoking of the fire! and Amy and Ray at Bookham. 4th July 1964 - Joy & Eric went to Thames Valley school fete. We met Mr & Mrs Quinton, Janet & Arthur, Bob Jenner, Mr Lyndham. 1. 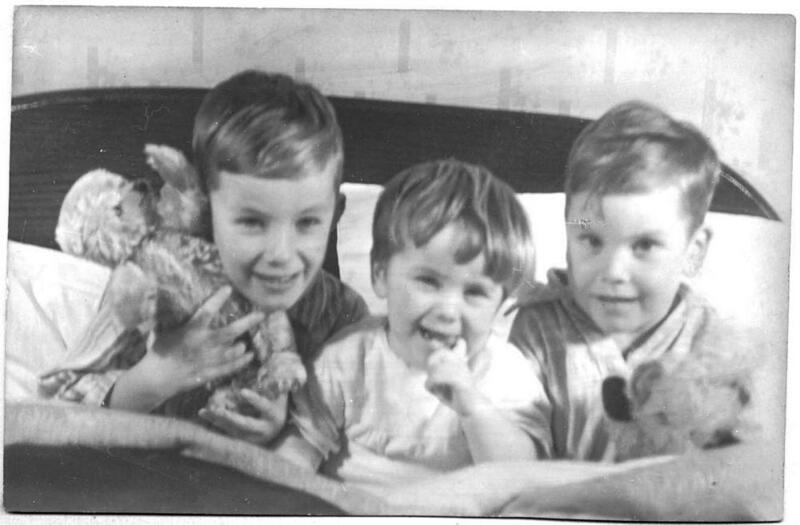 My big brother – always more independent than Owen or me, as first children always have to be. Being a first-born is always more difficult. 2. The fount of all knowledge - not just family history (he had a far better memory than I, well, he was older) and railways, but was a source of information in all areas of endeavour. Just after he died, a completely new railway station opened near Nottingham, a rare event. The first thought was to discuss the significance of it with him, but I couldn't. A set of collected family photos of Arthur is here and of Owen is here. Eric 07-Apr-2019 has a web site here and thousands of family photos here would appreciate an e-mail from any reader.